Large full-color touchscreen console with Android web browser. Extra-long running belt, 60-inches long. Robust 3.5 Commercial Horsepower Motor covered with a lifetime warranty. Easy to fold with the hydraulic shock-assisted lift. Tablet holder where you can attach your tablet and watch your favorite movies as you run. Maximum speed 12 mph and 12% power incline. iPod compatible (3-inches integrated speakers). 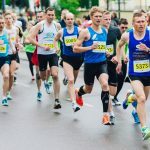 The treadmill is an astonishing piece of workout equipment that enables you to burn more calories without having to go jogging outside or even the gym. Treadmills like the ProForm Premier 1300 offer a convenient way to regularly exercise in all-weather conditions in the comfort and safety of your own home, and that is why most people love working out on them. However, there are so many brands and models of treadmills out there on the market today. 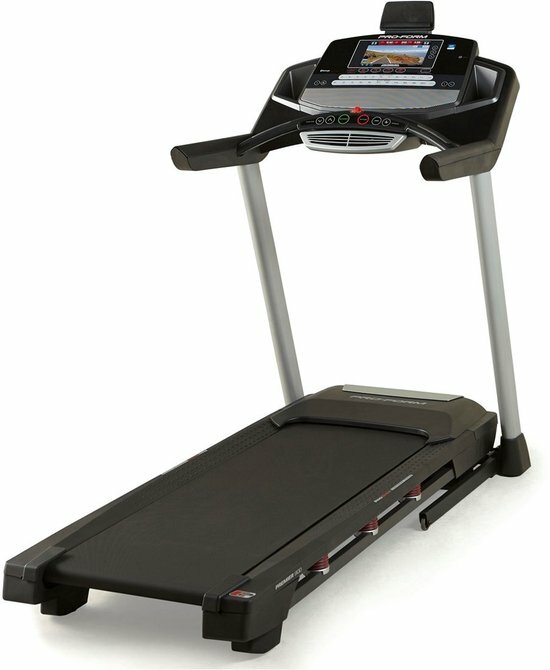 So choosing the perfect treadmill that meets your budget and needs is overwhelming with huge competition on the market. 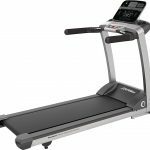 To make it much easier for you, we have researched the best treadmill available on the market to bring you this ProForm Premier 1300 Treadmill review. The ProForm Premier 1300 Treadmill is an excellent entry-level folding treadmill with lots of amazing features at a competitive price point. It comes protected with a lifetime warranty on frame and motor, 5-years limited warranty on parts, and 2-year limited warranty on labor. This means you can return the treadmill in case it encounters some flaws after few months or years of usage. Another impressive feature of the ProForm Premier 1300 Treadmill is the 20-inches by 60-inches belt it comes equipped with. The belt is extra-long, which offers you extra space to stretch out and move. This makes it an excellent option for runners and taller users. The built-in ProShox cushioning with four isolators helps absorb the impact shock of running. The air-based cushioning system helps to reduce the impact on your joints, ankle, and knee and offers a more comfortable workout experience. The ProForm Premier 1300 Treadmill comes fitted with a powerful 3.5 Horsepower commercial motor – the motor is constructed with high-end materials and guarantees to offer a quiet workout experience while still indoors. The 3.5 CHP motor is very sturdy and can withstand longer and more intense workouts. There is also a built-in cooling fan which prevents the motor from overheating thus extending the life of your treadmill. Plus the motor is covered by a lifetime warranty which makes the treadmill a great investment. The ProForm Premier 1300 Treadmill features a 10-inches touch screen which is full-color. 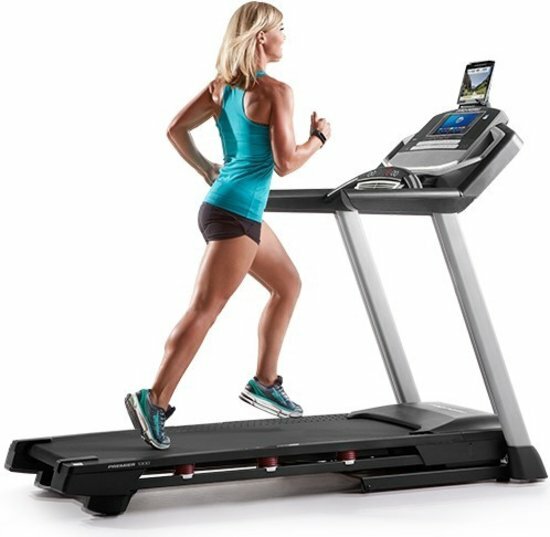 At a 10-inches across, this it is the most massive console and Android web browser which is best-selling for the ProForm Premier 1300 Treadmill. The touchscreen console serves as the control center where you can easily read your workout statistics and read whatever you want on the internet like reading the latest news, important emails, and catch up with your friends. The full-color touch screen is simple to use and user-friendly as well. Additionally, the ProForm Premier 1300 Treadmill is iFit enabled with the built-in iFit module. This allows you to connect to the internet and download additional workouts and track your fitness online. For there, you can set new goals and strive to reach new heights. It doesn’t stop there; you can use the Google map feature to plot out and discover new trails all over the world. You can use the console to identify actual landmarks and scenery on the new path you are running – this makes it feel more real. However, the iFit features require annual subscription to iFit.com which is sold separately. It comes preloaded with 34-workout programs to make the workout more interesting. All the 34-workout programs are uniquely designed by a certified personal trainer and also focuses on things such as time, speed, and incline goals hence maximizing your results. Also, the ProForm Premier 1300 Treadmill comes fully loaded with extra-accessories to make your workout experience more enjoyable and comfortable. The tablet holder above the console offers you a sturdy bracket to hold your tablet and also allows you to watch your favorite movies or Netflix shows as you run or walk. You can quickly adjust the tablet holder at different angles and height for a better viewing. The ProForm Premier 1300 Treadmill also comes included with a two-speed (high and low-speed settings) coolAire workout fan in the console to keep you fresh. For adding your favorite MP3s to workouts, the ProForm Premier 1300 Treadmill is iPod compatible. You can connect your device to the port of the console and enjoy your favorite tunes with the 3-inches integrated speakers. The ProForm Premier 1300 Treadmill also features a high 12 percent incline for added calorie-burning intervals. There are quick-change keys on the console to help you scroll through the incline levels with ease. The steeper the slope, the more quickly you will burn more calories. The treadmill comes fitted with a dual-grip heart-rate monitor so you can easily and accurately monitor your heart rate as you run or walk. There is Bluetooth compatible EKG heart-rate monitor function which allows you to monitor your heart rate wirelessly. But the wireless chest-strap is sold separately. Added, this treadmill is a space saver model – this means you can simply fold the treadmill into a nearly upright position when not in use – this way it will occupy a lot smaller space. The folding mechanism has an easy lift system that uses the hydraulic shock which slowly lowers the deck into position ready for use. On the other hand, the easy lift system assists in raising the treadmill to its stored position. You will have to subscribe online to enjoy the benefits of the iFit LIVE service. If you are still on the hunt for a smaller sized treadmill which is more compact and folds nicely saving you tons of space, then the ProForm Premier 1300 Treadmill is an excellent choice for you. It offers outstanding features at a reasonable price including 3.5 CHP motor which is covered by a lifetime warranty. Also, you will get 10-inches full-color touch screen where you can surf the internet, track your workout stats online, and enjoy the iFit LIVE scenery. The ProForm Premier 1300 Treadmill is a great investment for fantastic home workout experience.